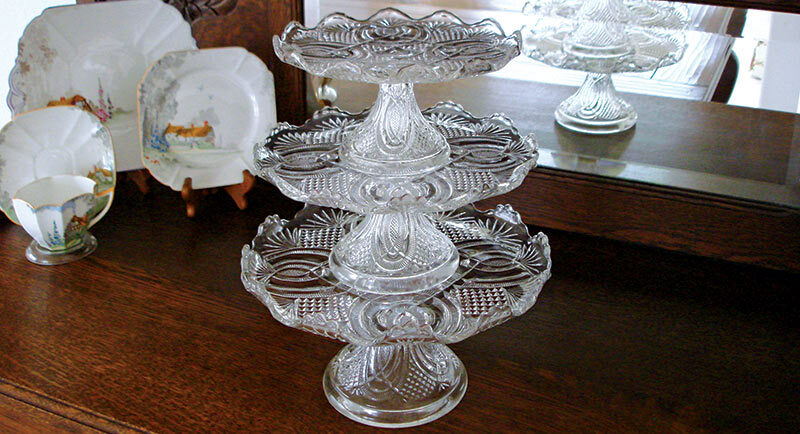 While selling antiques at local shows, I often hear, “Oh, you are the cake stand lady!” Although I sell many types of antiques, my specialty and first love are my Early American Pattern Glass cake stands. 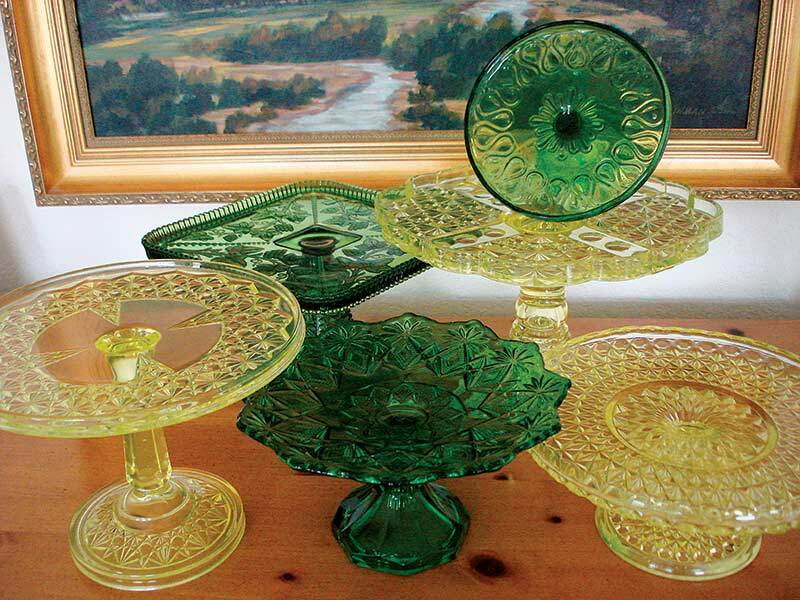 Early American Pattern Glass flourished in America between 1870 and 1910. The glass was affordable and beautiful and had the Victorian look that many Americans wanted to enjoy. Those selling features are still true today. 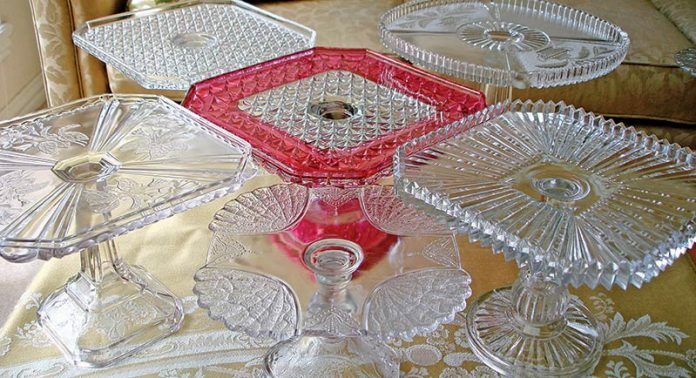 Pattern glass cake stands are still quite affordable and stylish—making it possible to own a small part of history in wonderful condition for a very reasonable price. My passion for cake stands started innocently enough more than 20 years ago while I was living in Alaska. The winters there are long and dark, and you need a lot of stimulation to keep the hibernation process at bay. A friend suggested that we take a cake decorating class, and I wondered if I might be able to find some interesting stands to complement my new hobby. My sister is an antiques dealer, and when she came to visit that summer, we set out to find some antiques stores that might have cake stands. Although the pickings in Alaska were very slim, my sister found a lovely pink Depression glass etched cake stand and gave it to me. That was the beginning of a collection that would number into the hundreds for me and eventually turn into a business that I dearly love. When my husband and I left Alaska and moved to Colorado 22 years ago, I was able to feed my new habit of collecting by going to antiques shows, stores, and auctions. I quickly amassed so many cake stands that I realized it would be a good idea to sell a few of my early purchases and focus on the ones that were rarer and more unusual. I set up a small booth at a local Colorado Springs show and made my first attempt at selling. I found that it was fortunate to have collected something that was interesting to many others as well. Thankfully, cake stands are appealing to the eye and also quite functional. In addition to serving cake, my customers have served entire luncheons on antique cake stands. They make a beautiful statement when arranged in different heights and shapes. 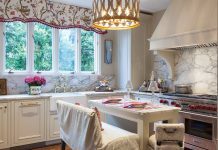 They may also be used in the bathroom with decorative soaps or in the bedroom with lovely perfume bottles displayed on top of them. On stands with a turned up edge, an ordinary pie can look spectacular. A few collectors even turn them upside down if the shape allows and use them to serve chips and dip! Since this era of glassware was primarily not made with lids, cakes or desserts should be put on cardboard rounds or doilies so that leftovers can be stored later in an airtight container. The rounds or doilies also prevent cutting lines on the glass surface to keep your heirloom in mint condition. What I appreciate most about the Early American Pattern Glass cake stands are the patterns themselves. Most of them are intricately detailed and beautiful. Many of them have different themes such as wildlife and nature, state patterns, political or historical events, and—my personal favorites—florals and figures. 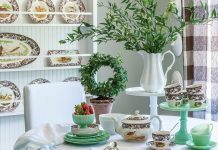 Many of my customers, who are able to show more restraint than myself, have narrowed their love of cake stands into specific areas of interest. Some of them collect only square shapes or children’s pieces, while others will buy only colored examples of the glass. Learning about pattern glass cake stands has been a fun journey that never ends. There is always a new pattern to be discovered either in books or at an antiques show or shop. Many people have asked me why I do not sell on internet auction sites. This would limit my favorite part of this business, which is the contact with other collectors. 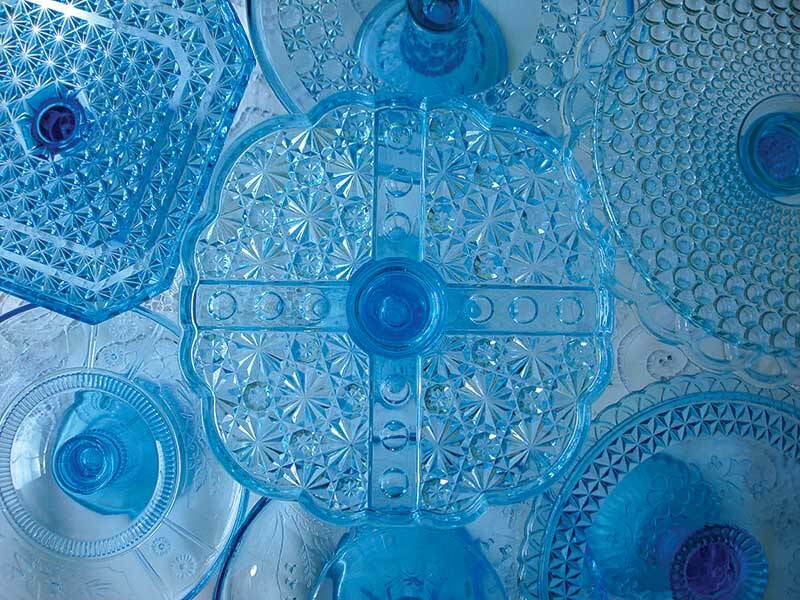 Shows give us a chance to discuss the glassware that we truly love and to exchange ideas and information. Most of my customers have become personal friends I look forward to seeing at each show. We all share the same passion for collecting a beautiful piece of history that we can hand down to future generations. 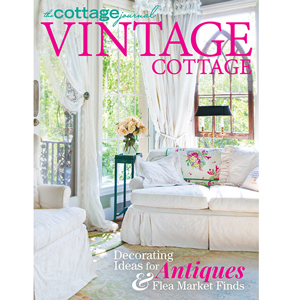 If you’re all about a good vintage find, then you’ll love Vintage Cottage 2018! 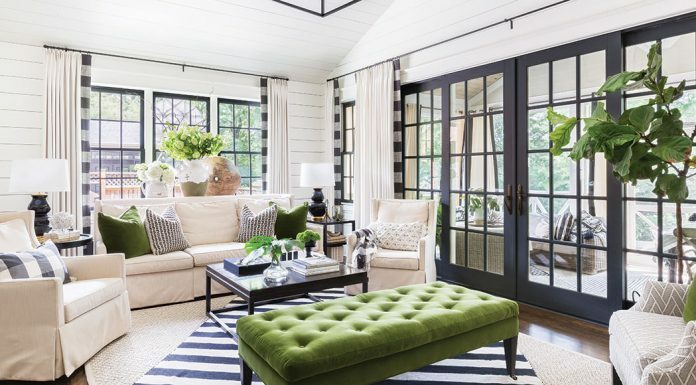 Shop the issue below!